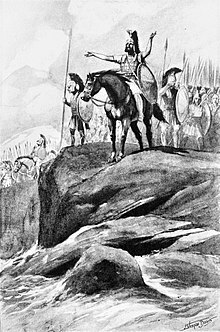 Anabasis (/əˈnæbəsɪs/; Greek: Ἀνάβασις [anábasis]; an "expedition up from") is the most famous book of the Ancient Greek professional soldier and writer Xenophon. The seven-tome book of the Anabasis was composed around the year 370 BC, and, in translation, Anabasis is rendered as The March of the Ten Thousand and as The March Up Country. The narration of the journey is Xenophon's best known work, and "one of the great adventures in human history". Xenophon, in his Hellenica, did not cover the retreat of Cyrus but instead referred the reader to the Anabasis by "Themistogenes of Syracuse"—the tenth-century Suda also describes Anabasis as being the work of Themistogenes, "preserved among the works of Xenophon", in the entry Θεμιστογενεης. (Θεμιστογένης, Συρακούσιος, ἱστορικός. Κύρου ἀνάβασιν, ἥτις ἐν τοῖς Ξενοφῶντος φέρεται: καὶ ἄλλα τινὰ περὶ τῆς ἑαυτοῦ πατρίδος. J.S. Watson in his Remarks on the Authorship of Anabasis refers to the various interpretations of the word φέρεται which give rise to different interpretations, and different problems.) Aside from these two references, there is no authority for there being a contemporary Anabasis written by "Themistogenes of Syracuse", and indeed no mention of such a person in any other context. By the end of the first century, Plutarch had said, in his Glory of the Athenians, that Xenophon had attributed Anabasis to a third party in order to distance himself as a subject, from himself as a writer. While the attribution to Themistogenes has been raised many times, the view of most scholars aligns substantially with that of Plutarch, and certainly that all the volumes are written by Xenophon. Xenophon accompanied the Ten Thousand, a large army of Greek mercenaries hired by Cyrus the Younger, who intended to seize the throne of Persia from his brother, Artaxerxes II. 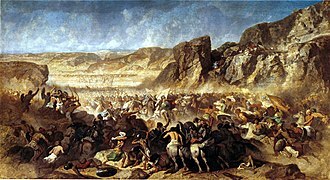 Though Cyrus' mixed army fought to a tactical victory at Cunaxa in Babylon (401 BC), Cyrus was killed, rendering the actions of the Greeks irrelevant and the expedition a failure. Stranded deep in Persia, the Spartan general Clearchus and the other Greek senior officers were then killed or captured by treachery on the part of the Persian satrap Tissaphernes. Xenophon, one of three remaining leaders elected by the soldiers, played an instrumental role in encouraging the 10,000 to march north across foodless deserts and snow-filled mountain passes, towards the Black Sea and the comparative security of its Greek shoreline cities. Now abandoned in northern Mesopotamia, without supplies other than what they could obtain by force or diplomacy, the 10,000 had to fight their way northwards through Corduene and Armenia, making ad hoc decisions about their leadership, tactics, provender and destiny, while the King's army and hostile natives barred their way and attacked their flanks. Ultimately this "marching republic" managed to reach the shores of the Black Sea at Trabzon (Trebizond), a destination they greeted with their famous cry of exultation on the mountain of Theches (now Madur) in Hyssos (now Sürmene): "Thálatta, thálatta", "The sea, the sea!". "The sea" meant that they were at last among Greek cities but it was not the end of their journey, which included a period fighting for Seuthes II of Thrace and ended with their recruitment into the army of the Spartan general Thibron. Xenophon related this story in Anabasis in a simple and direct manner. The Greek term anabasis referred to an expedition from a coastline into the interior of a country. While the journey of Cyrus is an anabasis from Ionia on the eastern coast of the Aegean Sea, to the interior of Asia Minor and Mesopotamia, most of Xenophon's narrative is taken up with the return march of Xenophon and the Ten Thousand, from the interior of Babylon to the coast of the Black Sea. Socrates makes a cameo appearance, when Xenophon asks whether he ought to accompany the expedition. The short episode demonstrates the reverence of Socrates for the Oracle of Delphi. Xenophon's account of the exploit resounded through Greece, where, two generations later, some surmise, it may have inspired Philip of Macedon to believe that a lean and disciplined Hellene army might be relied upon to defeat a Persian army many times its size. Besides military history, the Anabasis has found use as a tool for the teaching of classical philosophy; the principles of leadership and government exhibited by the army can be seen as exemplifying Socratic philosophy. Route of Cyrus the Younger, Xenophon and the Ten Thousand. Cyrus makes preparations in order to take the throne from his brother. Cyrus marches to take out the Pisidians and gains troops as he progresses through the provinces. Word spreads that Cyrus might be moving against the king and the soldiers begin to question continuing onward. Cyrus and his generals continue marching onward, now towards Babylon. Xenias and Pasion are seen as cowards for deserting Cyrus. The soldiers face hardship with few provisions other than meat. Dissention arises after Clearchus has one of Menos's men flogged, which leads to escalating retaliation. Orontas is put on trial for a treasonous plot against Cyrus. Cyrus sizes up the situation for the coming battle against the king. Cyrus and his army pass safely through a trench constructed by the king. The battle between Artaxerxes's royal army and Cyrus's army commences. Xenophon describes a sort of eulogy after the passing of Cyrus. The king rallies his forces and attacks Cyrus's army again. Then Artaxerxes retreats to a mound where upon being confronted again by the Hellenes, he and his men retreat for the day. The army finds out about Cyrus's death and heralds are sent to meet the army and ask for them to relinquish their weapons to the king. The generals of Cyrus's army and the officers of the Hellenes join forces to better their chances for returning home. The Hellenes are frightened by something in the night, which turns out to be nothing at all. The king asks for a truce and Clearchus asks for breakfast after establishing one. Clearchus says to Tissaphernes that the Hellenes only followed Cyrus's orders when they were attacking the king's authority. The Hellenes wait for Tissaphernes to return so they can leave. Tissaphernes comes with his troops and the Hellenes suspect they will be betrayed as they progress homeward. Clearchus trusts Tissaphernes enough to send generals, captains and some soldiers to his camp. This turns out to be a trap and Clearchus is killed and the generals do not return to the Hellenes's camp. All of the captured generals are decapitated and Xenophon describes their pasts and personalities. None of the Hellenes can sleep for fear of not returning home alive. Apollonides tries to persuade the Hellenes to go to the king to ask for a pardon. Xenophon tells the Hellenes to get rid of all but the necessities in order to travel homeward more efficiently. After crossing the river Zapatas, the Hellenes are attacked by Mithridates and find that they need better long-range weaponry. Tissaphernes comes after the Hellenes with a large contingent of troops. The Hellenes succeed in securing the summit first. The generals question their prisoners about the surrounding area and decide which direction to go after having reached the Tigris. The Hellenes travel through the land of the Carduchians and lose two warriors when Cheirisophus does not slow for Xenophon on rearguard. The Hellenes progress slowly through the mountains with the Carduchians making it difficult to pass through the area. There is a struggle to gain control of the knolls and hilltops. Despairing, the Hellenes do not know what to do with the Carduchians closing in from behind and a deep river with a new enemy lying ahead of them until Xenophon has a dream. There is a heavy snowfall in Armenia and Tiribazus is following the Hellenes through his territory with a formidable army. The Hellenes face hardships in the snow. They are later overjoyed by the hospitality received in a village. The Hellenes confront an enemy in a mountain pass and Xenophon suggests taking control of the mountain before traveling up the pass. The Hellenes have a hard time overtaking the Taochian fortress. The soldiers finally catch a glimpse of the sea. Reaching a populous Hellenic city, Trabzon, the soldiers take a long rest and compete against each other in games. The soldiers decide to send Cheirisophus back to Hella to return with ships to take them back home. The Hellenes are guided by the Trapezuntines to gain provisions from the Drilae. Those sick and over the age of forty are sent back on ships to Hella. Xenophon speaks of the temple he constructed to Artemis in Scillus. The Hellenes become allies with the Mossynoecians and agree to fight their foes together in order to pass through the territory. Xenophon persuades the ambassadors of Sinope into having good relations with the Hellenes. Taking the advice of Hecatonymus, the Hellenes take the sea route to reach Hella. Slander is spread about Xenophon and his speech in defense of his honesty to the soldiers results in prosecutions of certain soldiers. Xenophon talks his way out of receiving punishment for beating a soldier. The Hellenes make a deal with the Paphlagonians to cease fighting. Xenophon feels he should not be the leader on the last part of the trip. The army breaks up into three factions and Xenophon leads his troops back to Hella. Xenophon hears of the situation the Arcadians and Achaeans are in and rushes with his troops to their aid. The Hellenes do not find the sacrificial victims in their favor and cannot proceed nor find provisions until the signs change in their favor. Xenophon advises the troops to attack their enemies now instead of waiting for the enemy to pursue them when they retreat to camp. Agasias is to be put on trial before Cleander for ordering Dexippus to be stoned after Agasias rescues one of his own from false accusation. The Hellenes muscle their way back into the city after learning of their planned expedition to Chersonese. Coeratadas’ leadership falls through when he fails to give out enough rations for one day. Xenophon returns at the request of Anaxibius to the army after taking leave from the Hellenes for home. Xenophon works together with Seuthes to gain provisions for the Hellenes while Seuthes pays them for gaining land for his control. Seuthes travels through the countryside burning villages and taking more territory with the Hellenes. Heracleides fails to come up with the full month's pay for the work done by the Hellenes. The blame is put on Xenophon. Xenophon speaks on the charges brought against him about not giving sufficient pay to the soldiers. Medosades gains control of the land the Hellenes helped to conquer and he threatens violence if the Hellenes don’t cease pillaging his lands. Xenophon finally returns home only to find he is wanted to help capture Asidates, which according to the soothsayer, Basias, should be easy. 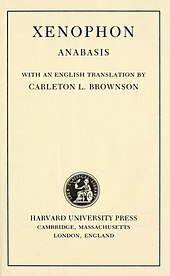 Traditionally Anabasis is one of the first unabridged texts studied by students of classical Greek, because of its clear and unadorned style; similar to Caesar's Commentarii de Bello Gallico for Latin students. Perhaps not coincidentally, they are both autobiographical tales of military adventure, told in the third person. Xenophon's book inspired multiple literary and audio-visual works, both non-fiction and fiction. The Anabasis of Alexander, by the Greek historian Arrian (86 – after 146 AD), is a history of the campaigns of Alexander the Great, specifically his conquest of the Persian Empire between 334 and 323 BC. Shane Brennan's memoir In the Tracks of the Ten Thousand: A Journey on Foot through Turkey, Syria and Iraq (2005) recounts his 2000 journey to re-trace the steps of the Ten Thousand. The cry of Xenophon's soldiers when they meet the sea is mentioned by the narrator of Jules Verne's Journey to the Center of the Earth (1864), when their expedition discovers an underground ocean. The famous cry also provides the title of Iris Murdoch's Booker Prize-winning novel, The Sea, the Sea (1978). Harold Coyle's novel The Ten Thousand (1993) shows the bulk of the US Forces in modern Europe fighting their way across and out of Germany, instead of laying down their weapons, after the Germans steal nuclear weapons that are being removed from Ukraine. The operational concept for the novel was based on Xenophon's account of the Ten Thousand. Paul Davies' novella Grace: A Story (1996) is a fantasy that details the progress of Xenophon's army through Armenia to Trabzon. Michael Curtis Ford's novel The Ten Thousand (2001) is a fictional account of this group's exploits. Jaroslav Hašek's dark comedy novel, The Good Soldier Švejk (1921–1923), uses the term in describing Švejk's efforts to find his way back to his regiment. John G. Hemry's The Lost Fleet series is partially inspired by Xenophon's Anabasis. Paul Kearney's novel The Ten Thousand (2008) is loosely based on the historical events, taking place in a fantasy world named Kuf, where 10,000 Macht mercenaries are hired to fight on the behalf of a prince trying to usurp the throne of the Assurian Empire. When he dies in battle, the Macht have to march home overland through hostile territory. Valerio Massimo Manfredi's novel The Lost Army (2008) is a fictional account of Xenophon's march with the Ten Thousand. Michael G. Thomas' series Star Legions is closely based on the work, with the series set far in the future. Sol Yurick's novel The Warriors (1965) borrows characters and events from Anabasis. It was adapted as an eponymous 1979 cult film, directed by Walter Hill. The first three novels of David Weber and John Ringo's science fiction series Empire of Man—March Upcountry (2001), March to the Sea (2001), and March to the Stars (2003)—are modeled after Anabasis. Conn Iggulden's historic novel The Falcon of Sparta is based extensively on the work. Anabasis, trans. by Edward Spelman, Esq., Harper & Brothers, New York, 1839. Anabasis, trans. by Rev. John Selby Watson, Henry G. Bohn, York Street, Covent Garden, 1854. Anabasis: The March Up Country, trans. by H[enry] G[raham] Dakyns (1897), reprinted in ELPN Press, 2007, ISBN 1-934255-03-3. Also available in Project Gutenberg. The March Up Country: A Translation of Xenophon's Anabasis into Plain English, transl. by W.H.D. Rouse, Nelson, London 1947. The Persian Expedition, trans. by Rex Warner (1950), introduction by George Cawkwell (1972), Penguin Classics 2004 ( ISBN 9780140440072). This page is based on the Wikipedia article Anabasis (Xenophon); it is used under the Creative Commons Attribution-ShareAlike 3.0 Unported License (CC-BY-SA). You may redistribute it, verbatim or modified, providing that you comply with the terms of the CC-BY-SA.